Choose from 18, 30, 50, 62, 76 or 100 miles. The ride begins in downtown Claremore at Gazebo Park, located at Muskogee Ave. and Will Rogers Blvd. The routes will take you through the scenic country side west of Claremore, through Oologah, then to the Claremore Lake area. The longer routes will continue east of Claremore through rolling hillsides then back into Claremore from the East. End the ride with a lunch at the Gazebo. Mechanical and SAG support will be provided. SAG support ends at 5:00 pm. All riders are required to wear an ANSI, CPSC or Snell approved helmet. Registration packets can be picked up at Bike-About Bicycles (300 W. Will Rogers Blvd.) on Thursday, October 5 until 7:00pm or on the day of the ride starting at 6:00 am. Maps of the routes will be provided. Be prepared for some hills. Riders under 16 years of age must be accompanied by an adult who is also on a bicycle and riding with them. Really cool long sleeve ride shirts. Must be ordered by 9/14/2018. 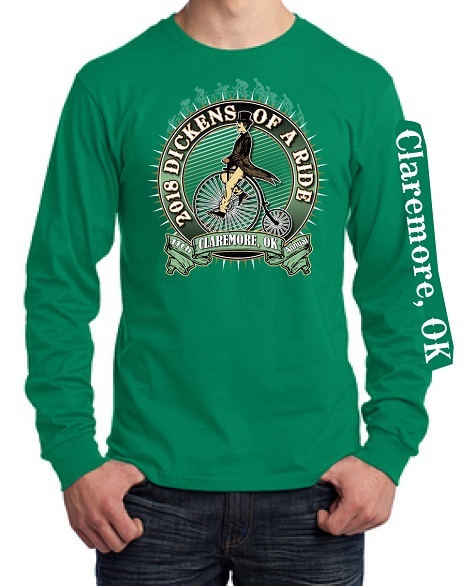 The Dickens of a Ride supports the programs and projects of Claremore Main Street, Inc. Proceeds from the event will help fund preservation efforts, economic development and special projects including planters, trees, benches and public art. When this page loaded, the official time was 3:08:05 AM EDT.